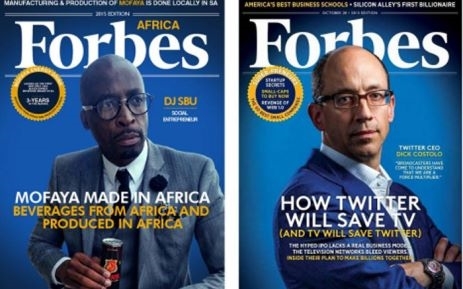 SABC radio’s DJ Sbu (Sibusiso Leope), could face legal action after a seemingly fake Forbes Africa magazine cover featuring him on it emerged recently. Representatives from the magazine denied ever featuring the jock on their cover with his latest energy drink Mofaya in his hand, and could take legal action. Forbes Africa’s editor, Chris Bishop said “It is quite upsetting to see a bogus cover. Our legal team is writing to him,” after they made the bewildering discovery on social media. Sbu has fired back and released a statement threating legal action against the publication too, citing defamation. The well-known jock said that he was not responsible for the cover and only shared it because he saw people doing it. In a radio interview earlier, he also denied ever being featured on the magazine cover, saying he was only featured in the magazine’s US edition.